How Common Is It For Someone To Get A Concussion In A Car Wreck? There are many outcomes that can come from being involved in a car accident. For some, their injuries can be as minor as a scrape on the arm or face. For others, however, much more serious injuries are acquired. One of the most common injuries people walk away from an automobile accident with is a concussion. You may think that because concussions are injuries that people obtain in many different ways that they are not that serious. This is a huge misconception, as concussions can be potentially life threatening in some cases. 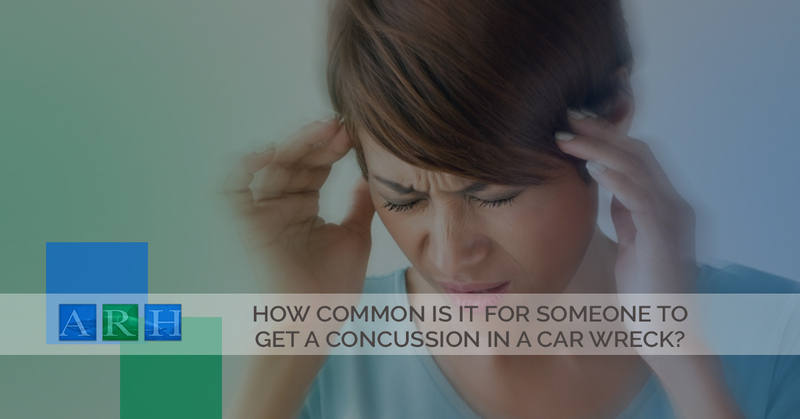 Continue reading below to learn more about concussions and how to proceed should you find that you have one after being involved in a car accident. The majority of people are well aware of what a concussion is in a general sense. However, besides knowing that they occur when someone takes a blow to the head, you may not know much else. If you speak to a physician about concussions, they will inform you that they are, in fact, traumatic brain injuries. When you are hit in the head, fall or experience any sort of incident that results in your brain being shaken or jarred, you can suffer from a concussion. This is true even in cases when no injuries are externally visible. In some cases, when a person experiences a concussion, they may pass out or lose consciousness. For others, they have absolutely no memory of what happened to cause their concussion immediately after the incident. On the other hand, there are plenty of people who have no immediate symptoms, even though they do have a concussion. While the most common outcome for those who suffer from a concussion is a complete recovery, there are many other outcomes that can occur as well. Recovery time is no exception either. For some, their concussion can be healed within a matter of hours. For others, it can takes a few weeks for them to return to their normal self. Alternatively, not everyone is so lucky and their concussion can lead to life-altering issues. Whether it be a noticeable change in the way they think cognitively, how they learn, they way they move or speak, permanent disability is not out of the question when it comes to those who sustain an injury like this. Often, many people have so much adrenaline pumping through their body after a car accident that they feel as though there is nothing wrong with them. In fact, it is often someone else who is close to the injured person who points out the changes in their demeanor and more. This is why it is imperative to have a medical evaluation after being involved in a collision. This will result in you becoming aware that you are suffering from a concussion, or allow for a physician to verify what you already thought – you are completely fine. Better safe than sorry though! If you have been involved in a car accident and you suffered a concussion that has caused you hardship, it’s important that you contact our personal injury lawyers at Alex Hernandez Trial Law. We can help you to discover what sort of compensation you are entitled to and do our best to ensure that the responsible party is held accountable for the injuries they caused to you. We look forward to providing you with the support and legal assistance that you need to move on from this traumatic event.